Judge Cheryl L. Post was appointed to the district court in 1993 and currently serves as the Deputy Chief Judge in the 18th Judicial District - Arapahoe County. Judge Post is the Presiding Judge for the Diversified Division hearing both civil and criminal cases. Her service to the 18th judicial district has included the domestic and juvenile dockets. Judge Post is committed to improving the processes in the court for the benefit of all Colorado citizens. As such, she has pioneered the use of e-filing, established a grant-funded pilot project for simplified and fast-track post-decree procedures, and developed case management protocols. Judge Post currently serves as the Vice-Chair of the Statewide Caseflow Leadership Taskforce and as the Judicial Liaison to the Office of the Child Representative. She has served on numerous statewide committees for court reform, participated in judicial and attorney training sessions as a presenter, and served as a mentor for new judges. Judge Post is a member of the CBA, CWBA, and a founding member and past president of the Minoru Yasui Inn of Court. As stated by Charlotte Wiessner of the Colorado Women's Bar Association, "Awards are not new to Judge Post." She received the Distinguished Jurist Awards from the American Academy of Matrimonial Lawyers in 2001. In 2003 Judge Post received the Raymond Frenchmore Awards for Outstanding Contribution to Juvenile just from the Arapahoe County Bar Association and was a judicial honoree of the Colorado Women's Bar Association. Judge Post has a B.A. in History and Secondary Education from Colorado State University, a M.Ed. in Counseling from the University of Colorado in Denver, and a law degree from the University of Denver. Judge Post practiced law as a civil litigator with the law firm of Holme, Roberts & Owen and Kobayashi & Associates in Denver prior to being appointed to the district court. Judge Roy Olson was appointed to the Jefferson County Court bench in April 1990. In addition to a mixed county court docket, Judge Olson shares oversight of truancy cases in Jefferson County. Judge Olson is a member of the District Attorney's Task Force on Domestic Violence, has attended numerous national seminars on domestic violence, and participates in periodic training in Jefferson County for victim advocates through Family Tree. Judge Olson has been enthusiastically described by Court Judicial Assistants Carla Stevens, Deborah Freitag and Richard Mailander as "non-biased, understanding, patient, and courteous to those who are in front of him." Judge Olsen has consistently demonstrated a willingness "to help out other divisions, (and) take on extra work such as the Truancy Docket." Judge Olson has demonstrated a commitment to his community through his participation in high school Moot Court Competitions, involvement with the Drive Smart Evergreen campaign, and volunteering to speak to students in the courthouse and at schools in his community. Judge Olson served for eight years as a member of the Community Responsibility Center's Board of Directors and six years on the Colorado Commission for Judicial Discipline. For over 30 years Judge Olson has been associated with the Forest Heights Lodge, an Evergreen-based treatment center for emotionally disturbed children and adolescents. His service to the Lodge includes a term as a member of the Board of Trustees. Judge Olson has a B.A. from the University of Colorado and a J.D. from the University of California Berkeley. From is admission to the bar in 1972 until his appointment to the bench in 1990, Judge Olson was in private practice as a lawyer specializing in criminal, juvenile and family law. 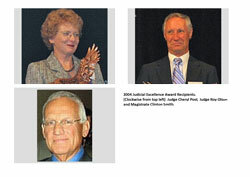 Magistrate Smith was appointed to the 10th Judicial District - Pueblo County bench in 2000. His docket includes all juvenile delinquency cases and all attorney-filed dissolution of marriage and custody cases. In addition, Magistrate Smith presides over all county court civil cases. Magistrate Smith currently serves on the Juvenile Probation Services Committee. Tenth Judicial District Court Administrator Karen Studen has described Magistrate Smith as having a great "day-to-day work ethic, commitment and genuine love of his job. He arrives daily before 7 a.m., often takes no lunch break and many times leaves after 5 p.m. - all the while never complaining and always maintaining a positive attitude. He actively offers suggestions and proposals for changes and efficiencies. He always considers the impact on everyone involved. Many of his suggestions for change center on making things easier for the lawyers, court customers and clerks rather than to meet his own needs. Staff and supervisors have found Magistrate Smith to be accessible and willing to discuss any situation needing his attention or involving his division. When the District lost staff as a result of a budget crisis, Magistrate Smith did not hesitate to assume a greater day-to-day "clerical" role in running his division, including not only the preparation and processing of paperwork but also operating the electronic recording system. He is a true team player and consistently goes the extra mile to help make this district the best it can be." Prior to being appointed to the bench, Magistrate Smith worked in the Pueblo District Attorney's Office from 1973-1980. Upon leaving the DA's office in 1980 he spent 20 years in private practice focusing on domestic relations/family law cases in addition to criminal defense work. Magistrate Smith is a member of the CBA and Pueblo County Bar Association. He is a past member and president of the Optimists Club. Magistrate Smith has been married to Karen for 25 years, has 3 grown sons and 4 grandchildren. He is an avid outdoorsman, spending his leisure time hiking, biking, backpacking and snowshoeing.